Have you finished reading the book, enjoyed it and would love to talk about it online without having to worry about spoilers? Or would you simply like to enter this give-away to win a dedicated (or/and signed) hardcopy of Grey Sister? You are all in the right place! To enter comment with your thoughts on the book under this post. 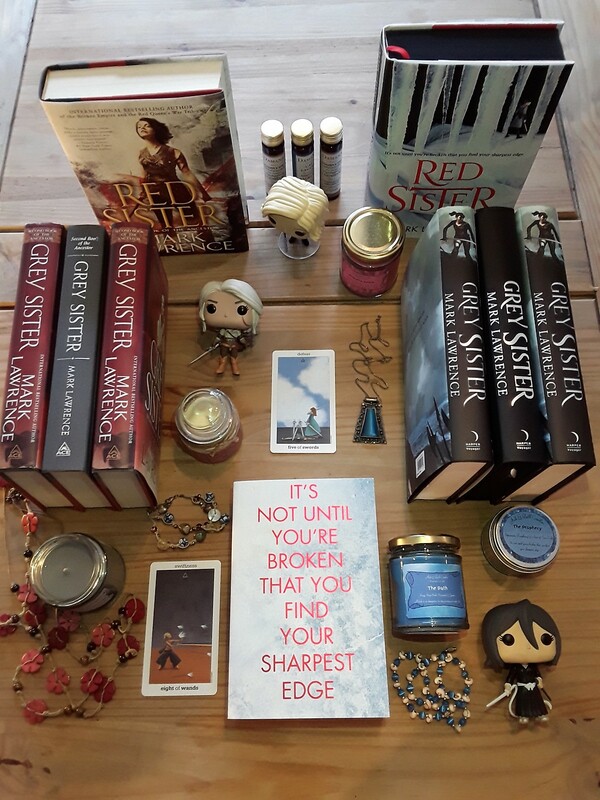 You can tell us who your favourite character was, which scene you liked best, your favourite line if you had any, what intrigued you, how the novel made you feel or anything else you would like to share with us about Grey Sister. The give-away will be open for three weeks, Mark selecting a random winner from the participants on 9th of June. First, Zole emerges, an object glowing with ultraviolet energy. She calls herself the Chosen One, yet it seems something it is something monstrous that chose her. Afterwards, we see Abeth’s present. The world is on fire. Smoke on the horizon. Yet the Noi-Guin emerge only for one reason. Revenge. Their master, the spider of that dark web, has crawled from his hollow in the earth, and seeks a fly in Nona Grey. And though she has the eyes of one, she is far from a simple insect. Nona has learned the work of the Grey as well, or so it seems. The Trial was a prelude to greater deceptions. Red Sister, Grey Sister, Mystic or Holy, we don’t know. But we do know that there will be grey earth, red blood, mystic might and holy destruction. So goes the Book of the Ancestor. So goes the Book of Nona. I felt almost sad that Keot left Nona – although obviously it was a good thing. The dynamic between Keot and Nona was so interesting! And I look forward to seeing the relationship develop between Keot and his new ‘subject’. I could quite easily devour Holy Sister today, I can’t wait for it to come out! I think the book had a good pace all around except at the end. There was a speed for the story that accelerated at the end and it felt very abrupt. Like “wait, where is the rest of the book, how can it end now? Just 3 pages ago the story was at the mid-part!”. Other than that, the writing was superb and, being a middle age man (grown, with a beard, and kids), I discovered I felt a lot of empathy towards some teenager nuns. I find that frightening. Jorg versus Nona. Hmm gonna leave that to contemplate. And then perhaps Jorg versus next book upgraded Nona. Brutal and beautiful. Cheers Mark. It was soo good even better than Red sister but in a completley different way. I loved how Nona character developed and her relationships with the other characters were phenomenal even if it wasn’t always positive. The long-awaited sequel to Red Sister, Grey Sister, delivers more than any reader could have expected. Grey Sister outshines its predecessor and continues to develop the cast of female characters in a wonderfully unique (and believable) manner. The Book of the Ancestor series is quickly turning into one of my favourite fantasy series. The characters are so wonderful in this series; I am emotionally and mentally invested in the outcome of each character. The story is female-lead, which is rare in fantasy. The characters (female or male) are fully developed human beings, have real personalities and thoughts, and have real faults like, you know, people, which makes this series almost singular in the genre. Lawrence’s world-building continues to be spectacular. We are exposed to much more of his world through the travels of several characters. The more he reveals about the world, the more the reader understands the need for grim, resilient, and harsh characters. The world is bleak, severe, and requires survivors to push themselves to extremes. It is a world where the stories cannot end until the moon falls. I hope to revisit this in other series and novels by Lawrence. The writing is skilled in every manner. Swift changes in perspective kept the action building and rolling forward without breaking it awkwardly into chapters or whole parts (looking at you Tolkien). There are moments of profound insight and moments of much needed comic relief. Lawrence is indeed a master of his craft. I have read the book. I am reading it again after a proper amount of time. Mark’s slightly freewheeling style of writing is at full bore with this second book in the trilogy Book of The Ancestor; we are allowed to get to know these characters much better. The internal dialogues of Sister Glass especially aid in slowly but surely revealing an under-story exposing just how short a time this planet and its inhabitants have to survive. Sisters Kettle and Zole are given stage-time, and the rest of the new characters are both fully realized and allowed to be as morally ambiguous as they please, as their own internal compass was designed on this planet and not ours. Mark is not short-changing either the reader or his characters. In essence Grey Sister not only gives us much more of Nona and even more reasons to wish one could give her a hug sometimes, but gives the this amazing cosmology more room to breathe and expand. Thanks, Mark, Good Form. I love this book! I think the character development with Zole is amazing. She is quickly becoming one of my favorites. The emotional battle I have over Clara is ridiculous! Do I like her, do I hate her? It seems to change on a chapter basis. Overall Grey Sister was so much better than I even expected! I cannot wait for the next one! My favorite part was the grey testing, loved that. Followed closely by the Freaky Friday segment. I actually laughed out loud even though the events were more scary than funny. It was gripping.Also, well done you for best Save Everyone Using a Mountain scene ever. Noi-Guin! 🙂 And that would be interesting. I loved the Grey Trial. She seems so screwed because of how noticeable she is. But like a little spider, she watches and waits and plots. I got a huge kick out of how she achieved the goals for the Trial. Overall, a fantastic second book. I look forward to the third! Probably the most striking thing about the Ancestor trilogy is Lawrence’s ability to make me, as a middle aged male, empathize with a very young female protagonist. If I hadn’t read his first two trilogies and loved them, I might have passed on this series based on that premise alone. I am so glad I didn’t, because Red Sister was probably the best book I can remember reading in the last 10 years. That is until I read Grey Sister. Grey Sister continues the story, but with even more passion. I was almost angry at how much I cared about these characters. A very powerful read. I’m really loving the Keot and Nona dynamic. I devoured each book and can’t wait for the next one to come out. Thank you! After coming off reading The Broken Empire trilogy, I was hungry for more Mark Lawrence. He send me a signed copy of Grey Sister and I read it at double the Speed of any of book I have. I was, once again, consumed in a Mark Lawrence book. I loved the charecter development and just the unapologetic tone of the whole book. The dynamic between Nona and Keot was fascinating and I loved it. The only critisim I have at this moment is a petty one, I really do not like the front covers! Compared to The Thorns series I think they look pretty poor and at its worst, put people off buying the book. While I personally agree with you in terms of the covers I felt important to mention that Mark doesn’t have much say in what covers his books receive. It’s (and the publishing date, too) is entirely the publisher’s decision. A great point to make. But in terms of marketing and sales, it makes a huge impact so I felt compelled to mention my thoughts on it. A great point nonetheless Mitriel. Grey Sister was an excellent read. I loved that although we got Glass’s POV and tidbits of her backstory, she still carried that element of mystery with her from Red Sister. Of course now I want more backstory on some of the other nuns at Sweet Mercy. I also really really loved the first scene with Apple and Kettle! I was hoping that we’d get to see them reunite, and that we’d get to know at least one of them a little better and I’m so glad that we did! Kettle was amazing, and I was so excited to see her develop and interact with Nona and Zole in the second half of the book. All of their scenes were incredible. I’m still not sure if I want to punch Clera or give her a hug, but I was happy to see her again, her snarkiness was missed. I also thought I’d never be sad to see a devil forced out of someone…but I was!! (I’m pretty sure I’m naming my next pet after Keot.) Though my absolute favorite parts in this book were the Grey Testing (that entire scene had me rolling) and the final battle scene at Sherzal’s palace (Ara and Darla were so awesome). All in all, this was a pretty fantastic read! I laughed, I cried, I grumbled in frustration….and I can’t wait to read the next one! Thanks Mark! I loved it when sacrifice drove Keot away but I keep assuming that her opponent was simply more murderous and attracted him to her. I love this series. The flaws in the protagonist feel so relatable. On a shallow note totally shipping Nona and Ara so hard. This was a lovely book with exceedingly strong characterization that draws you deeply into the story. Mark Lawrence knows how to balance it all, it seems, plot, pacing, momentum, characters and location are all superb. As a result he immerses you in the story so quickly that you feel a little bleary eyes when it is over. Red Sister was such an invigorating read, with enchanting host of characters. It’s like a fantastical blend of Dragon Riders of Pern and Red Sonja. I love that each girl at the convent has her own forceful personality. No one is left behind. The mistresses are simultaneously humorous, intimidating, and charismatic, and the antagonists motivated and spiteful. Oh, did I mention 90% of the book’s characters are women? Whoops, might have forget that point rambling about everything else. I just finished Grey Sister, and like the first book it was just as invigorating. Lawrence knows how to write convincing women and men. He’s made the world feel tangible. One of my favourite things about the season is actually the narrator for the audiobooks. Hillary Duff has this delicious, smokey rasp of a voice that very much suits the dry wit of the girl. She isn’t limited, however, to a mature tone. She carries the youthful energy of the convent girls, the maliciousness of Raymil Tacsis, and the sensitivity of Nonna. If you get the chance, listen to the audiobook. Thank you Mark Lawrence for such an inspiring, beautiful series! Can’t believe that it gets better than red sister. But great exploration of character and development throughout grey sister was on point. The use of keot as a catalyst to all of Nona’ s darkest impulses is fantastic. I would sell my soul to get holy sister now. Another amazing book. Zole’s development had me in tears, and at the end serious worry for the characters future. It’s great to have Nona and co out of the convent, and taking the fight to their enemies. A very pacey story but still easy to keep track of. Not usually a fan of fantasy where the main actors have heavy duty magical, or exceptional physical, skills that they can call upon in critical situations, and that’s a rather different approach to the talents of your main characters in your early books. But I think you handled it well. The nature of the magical skills is explained clearly, mostly during the preceding volume, and you show they find it tough to utilise them too. Plus the opposing sides are reasonably easily matched in that regard. The storyline has been enthralling so far but genuinely unsure where you’ll take us next in the 3rd book – which is a good thing.